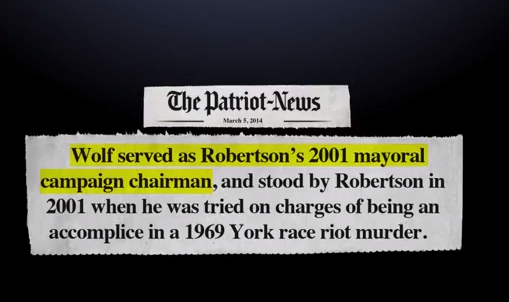 Rob McCord released a new ad hammering the relationship between Tom Wolf and “admitted racist” York Mayor of 1969, Charlie Robertson. 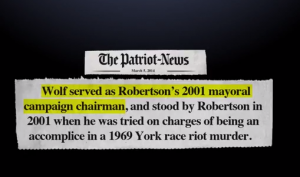 Robertson was found not guilty in that charge of first degree murder, and Wolf has stated that his role on Robertson’s campaign was more of an emeritus position than an active role in his election. It’s also interesting that McCord begins the ad pointing out that Wolf spent millions on television advertising, when he, too, contributed nearly $2 million to his own campaign. Wolf, of course, contributed $10 million, just under half of which came from a personal loan. Guil by association does not mean you accept those beliefs. This allegation is reproachable. Is this tactic related to Senator Toomey’s despicable approach to defeating Debo Adegbile–guilt by association? It worked then. Will it work again? I think my approach will be to presume every political ad, positive or negative, is inaccurate. The only way to learn about a candidate is to read the news. Even that can’t be trusted but I have to start somewhere. The African-American mayor of York, PA does not feel that Wolf is racist and has endorsed him. I find this campaign smear of racism by association very distasteful. It’s only racist if a Republican does it. I’m perfectly satisfied with how my comments have splintered and exposed your double talk through this thread. Corbett already has his own history of furthering racial discrimination in his job and public policy: VoterID law which was designed to disenfranchise black voters or the sting operation against black legislators. 2) but then, that basis should have been the focus of the attack, rather than the non-issue of the current attack. Rob’s trying to take a non-issue and make it the basis. You can try to spin it all you want with false equivalence, but the problem here is the smear nature of Rob’s attack and blatant use of racial issues in a misleading fashion. If Corbett did what Wolf did and McCord hit him with this in the general, the only thing we’d be hearing from you guys would be egging him on.